Peterborough MP Stewart Jackson believes the EU referendum has shaken politics up out of all recognition. The eurosceptic MP said he was delighted and proud that his constituents had backed leaving the EU by over 60 per cent, and called on Chancellor George Osborne to be moved from his position. Mr Jackson said: “I’m delighted. I though we might get 57, 58. I think Peterborough ranks as one of the most eurosceptic parts of the East of England. “I think things are developing in a pretty positive way. It’s certainly premature now to declare anyone has won. “We were written off earlier today, but we’re back in the game now. “I think politics in this country got a whole lot more interesting tonight. “It was incumbent upon Remain to run a positive campaign of the vision Europe would look like. And actually, if you say to people who have a vote, that you’re stupid, backward-looking, xenophobic, racist and you don’t really know what you’re talking about, you can hardly complain when they turn around and kick you in the ballots, which is what they’ve done tonight. “It wasn’t a positive campaign for Remain. We tried to fight a positive campaign on the Leave side. “Peterborough has its own issues around immigration, allocation of resources, and it was always going to be a Leave win here. Mr Jackson also said the political parties will need their own internal debates once the referendum has finished. “The Conservative Party has some very serious questions to answer, particularly the Chancellor and the Prime Minister how they conducted themselves in this campaign,” he said. “I’ve made it quite clear that I think George Osborne’s position is untenable as Chancellor, he should be moved. And Mr Cameron’s position we don’t know yet, but it’s considerably weakened. “The Labour Party seems to have turned its back on a significant number of its core voters in supporting Remain, the Liberal Democrats are a complete irrelevance and of course UKIP have got some big questions as to what they’re for any more. “Politics has been shaken up out of all recognition. The Peterborough MP also showed his pride at finally seeing an EU referendum take place after years of campaigning for one. “When I stepped down from job in the Government in October 2011 to campaign for an EU referendum, this was what it is about,” he added. “Some decisions, once in a generation, are too important to leave in the hands of politicians, and you must trust the people. Councillor Ed Murphy, Labour and Co-Operative member for Ravensthorpe on Peterborough City Council, saw the positives from the Remain camp’s performance in Peterborough. He added: “I was predicting 40 per cent in Peterborough for the Remain. Peterborough has been billed as the most eurosceptic area in England, and we got 40 per cent of the vote here which is quite good considering people in Peterborough have put up with six years of austerity and are not happy with the Government. “One good thing is there were thousands of people who had never voted in elections, got registered, and voted today. And I believe a lot of them voted Remain. 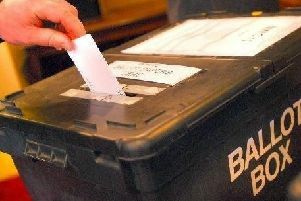 “People got engaged in this vote in Peterborough. We need to analyse why they voted to leave and I think they were voting against the Government and trying to give the Government a kick. “They didn’t believe the politicians. I think this bears well for the future. We will have higher turnouts in elections in Peterborough and hopefully we will have better representatives because of that.